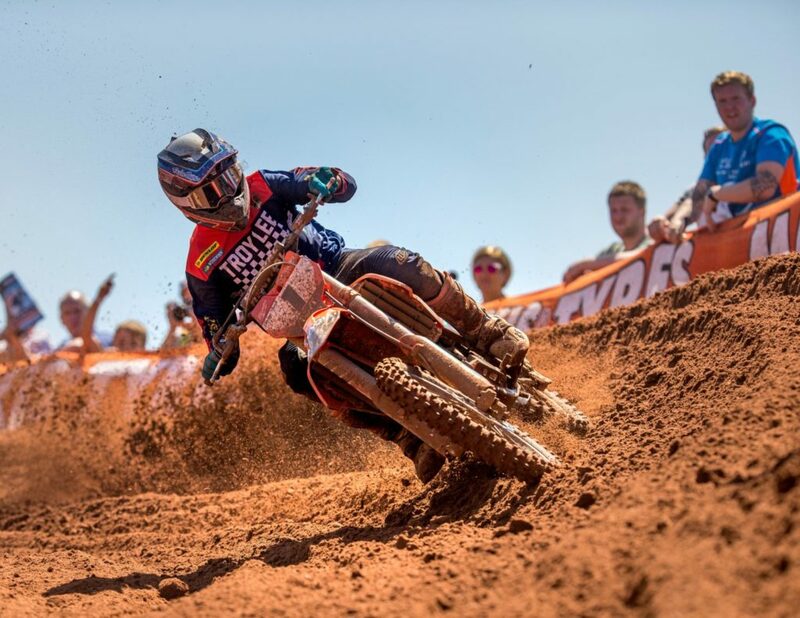 It’s not the ideal way to start a season with a press release announcing the retirement of your 450 British and MXGP rider who has been forced to call time on the sport after a badly broken wrist sustained at the final GP of last season in Imola. 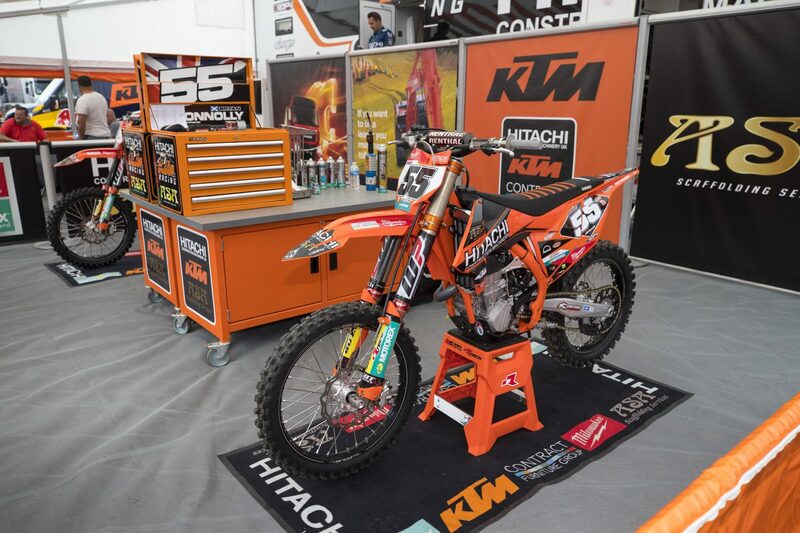 But Roger Magee and the Hitachi KTM UK squad powered by Milwaukee has been around the sport a long time and won’t rush into any dramatic decisions following Graeme Irwin’s shock retirement from the sport just as he was getting his world championship opportunity. With just a few days until the season-opener at Hawkstone Park we caught up with Roger to talk about Graeme’s unfortunate situation, his new rider Bas Vaessen and defending MX2 British champ Conrad Mewse. On a personal level for Graeme it’s not good but also for you as a team owner, are you able to plan for something like this? No the situation is we don’t plan to bring anyone else in. One of the reasons is there isn’t a rider out there of the calibre that we need. If there is nobody available then we will just concentrate on Mewse and Vaessen this year. We will look at it reasonably early then in 2019 (for 2020) to see who is available and at the right price. We know we can supply the right equipment and everything else. You need that rider that is capable of winning the British championship and finishing top ten in the world and at the moment there is nobody that we know is available that can do that. On Graeme, you had him at the beginning of his Pro career and got him back when he was British champion, so is there a personal and emotional interest in his career as well and not just as a team owner? Yeah, because we are both from Northern Ireland we ( the team) had sort of grown together if you like with his career, okay he left for a few years and then came back but we were always on good terms. He’s been doing this from he was three, it’s a generation and unfortunately we don’t have the riders coming through at the moment who are looking likely to fill his boots ( in Ireland) so on a personal level with Graeme it’s gutting for him and team but also for the sport here. To narrow it to one event the MXON, not to take away from the other riders, it greatly diminishes their (Ireland’s) chances of qualification, not that that is really a big factor in the overall things but there are a number of things his retirement will affect. I know once he gets his head round it, he has already got knuckled down into what people would call a normal job, until he gets his mind clear and sees what other opportunities can arise. I’ve no doubt he is not finished with the sport yet, either motocross or circuit racing but it is too early to make that call, certainly if he came out and rode an Ulster championship he would probably still win but that’s not where he wants to be. There are a number of different routes he can take but it’s up to him to select his own path. With the wrist still not right, I suppose it takes time to see whether he knows if he can race a road bike yet? There are other alternatives such as a thumb throttle and things like that but I don’t know enough about it to make any comment as to if it would be wise or not. I know he is going to try it (circuits) sometime later on this year and we wish him all the best in whatever he ends up doing. He will still be probably coming to some of the motocross events with us as a guest of the team, he is very good at PR and meeting people. He and I have talked about a number of potential opportunities within the sport but we are waiting on a few things to fall into place before we can announce those. His season last year was a bit up and down but the speed was there, he just had a lot of injuries and I guess adjusting to the world championship, so it’s maybe more frustrating for you and Graeme because this year he had the GP experiance going in and was going to be able to show more of what he could do at world level. That’s the case. I would say at some of the events last year he was riding quite conservatively to not get injured and then he had a couple of freak ones such as burns to his back when the bike landed on top of him and caused that, then getting the split lip in Switzerland which are two things you can’t legislate for, you know? We knew he had to be consistent last year but fate dealt a blow and we weren’t able to secure that British championship and he was starting to feature well in the Grand Prix results but that one crash in Italy just brings everything to a stop. We think there was maybe some rocks on the upslope and that gave him a kick one way then the other way and that just spat him off. I had been doing a bit of research on the scaphoid and it takes twice the force to break a scaphoid than it does to break any other bones in your wrist so it must have been a pretty big impact. I think that was the same injury that ruled Rick Johnson out of the sport, even though he tried to race on for a couple of years. Yeah there are a lot riders, the scaphoid is a career threatening injury depending on how bad it is. Whenever they opened Graeme’s wrist to fix it, the scaphoid fell out. From that it had to be pinned and with no blood flow for those four days (between the injury and surgery) it caused the bone to die. So it’s the just the two riders as it stands, we know what Conrad can do and you have Bas Vaessen, a new rider on the team, what did you see in Bas to bring him to the team? Certainly when he was on Suzuki, he had a top three, which on a Suzuki in the MX2 class is a bit of an achievement anyway! With the demise of the Suzuki team he had to find another slot and he went to Honda and you could see flashes last year when he was in Hunter Lawrence’s tail at most of the GPs and possibly on a slightly inferior bike than Hunter Lawrence so we knew it suited both parties to form a deal. Yeah he had about six weeks in California, his parents have a place out there. Then he was back to Redsands for three weeks and he will be at Lommel this week. All things look good, he’s not just on the pace of Conrad just yet but not too far off it. But we will see when they get down to racing what happens! And Conrad the whole world knows how quick he can be when he is on his A game, but reading the book on your team, it seemed like everyone is scratching their head trying to get the the consistency from him. Do you feel he is maturing into that now or how do you feel his off-season has been from your perspective? I think he has grown in maturity over the winter period and he has gone back with a trainer he had some years ago at Bath university. It’s all looking good, I know his physical condition is very good, it’s just getting that mental strength now which he has shown that he has improved from last year but we will not know until the racing starts. Do you think winning the British championship last year maybe takes a bit of pressure off him because now he has already won a big title in his career? I think the monkey is off his back, he was definitely the quickest last year but there were a few circumstances with other riders were there as dirty riding and a couple of situations where the weather conditions changed making it a bit of a lottery. But he came out in that last race when the chips were down and he just blitzed the opposition and that’s the way he should ride every race but it doesn’t always work like that. Finally just on the book that was written on the team by Andy Gee, it was definitely a warts and all look at how a team is ran with all the ups and downs for the riders and team staff. I’m sure a lot of people were surprised with all the details being allowed out, did you have any problem with the book being so open? Quarrels within the team were made public but it gave an honest apparaisal of what it was like. Well that’s what we wanted to do. There are times you have to be a bit more corporate in certain aspects but with something like that we didn’t say anything detrimental to anyone or slag anyone off as such and we only told the truth. If some have taken it personally then they need to look in the mirror and not us, okay everyone will have their opinion but we didn’t want it to be a glossy everything is rosy in the garden type thing – because it’s not. And it’s not just with us, all the teams at different levels have similar scenarios that come up during the year because it is a pressured environment. The mechanics are living in each other’s pockets with different personalities, things can get heated at times but you just have to work round it and at the end of the day everyone sticks together as team and if you don’t that then you aren’t here anymore! It’s seems from an outsider that running a team is a bit of a logistical nightmare at times! But you seem to enjoy putting all of the pieces of the puzzle together still? Well it doesn’t get any easier, but it helps when you have good sponsors that are loyal and will pay up on time and appreciate what we are trying to do not just to help the team but to help their business as well. It’s why we have been able to have Hitachi on board for quite a number of years and we have Milwaukee on board on a multi-year deal as well so that gives the team a bit of stability and now it’s up to the riders.